I am Antonio Lai, born and raised in Hong Kong where I’ve worked for the last 22 years in this industry. I studied hospitality and my first job at 18 years old was at Planet Hollywood as a waiter. After a few years, I moved to a bartender position for 2 years. After that, I worked in different restaurants and discotheques still as a bartender. Then I changed for the coffee business and opened Jacky Chan Cafe in Beijing, Singapour and Malaysia. Back in Hong Kong, I joined a restaurant called Finds where I worked on molecular cocktails and at the same time as a consultant for other places. Nearly 8 years ago, with a partner, I opened Quinary, a bar inspired by the concept of 69 Colebrook Row after a trip at The Drink Factory in London. 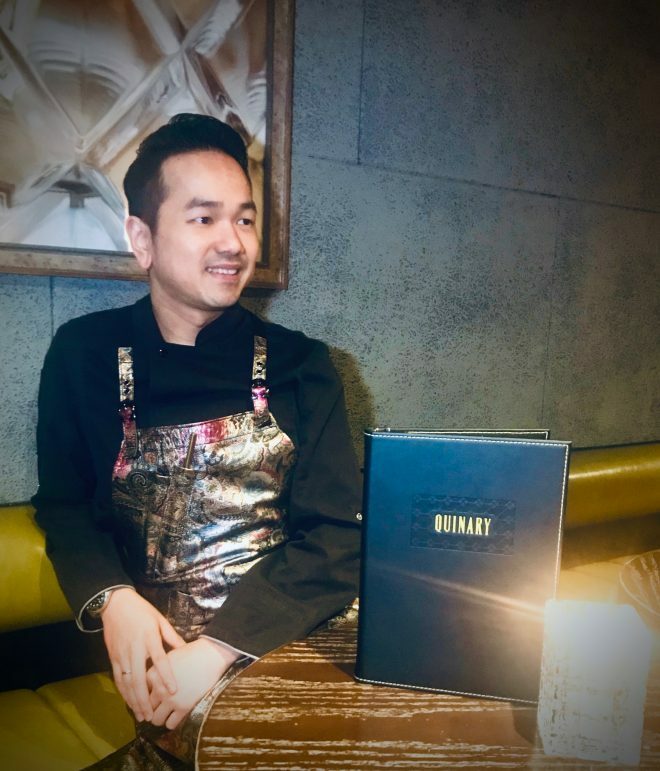 The reason I opened Quinary was to focus on cocktail culture in Hong Kong, with all the last innovation used to make cocktails. The idea was not to serve just drinks but deliver an experience to our guests. For instance one of our best sellers, is the Earl Grey Caviar Martini, the one I’ll make for you. You can see, you can taste, you can smell, and people love that. I think that’s why we got a lot of exposure and one year after the opening, we joined the World 50 Best Bars and we are still part of it. Four years ago, I participated to the World Class Competition and finished in the global top 8. Thanks to the success of Quinary we opened other bars a few years later, a gin bar and a hotel bar, then a third one, a restaurant with a bar for cocktails pairing. I would open a bar in London or in the US, because of the cocktail culture there. It would be like Quinary but with a better bar setting top help us to speed up a little bit more. So I would keep the same layout but change the bar stations to have more space. Otherwise, nothing would change because people tell and write comments to say they like the place, and they have a good experience, so that’s the most important. The real challenge is to find good bartenders and even more complicated to keep them, so you need to create the right environment, where they have fun and learn something. Here our turn over is quite low, so it means that the staff likes the place too. Then so no need to do something different. Every Sunday I am off, so I go to watch movies or cook at home with my wife. I just try to relax, because we work hard. I would say gin. Different gins have different taste. Like Monkey 47 is super floral or Tanqueray Ten is more on the grapefruits notes. There are so many gins, now there are even gins in Japan like the Roku. Here in Hong Kong, we have yuzu gin, or in Thailand gin based on Buddha’s hand. I have a gin bar, so I like working with gin. It’s about what the customer likes. For instance, if I was a customer, I don’t drink a lot of alcohol and I have a sweet tooth, so it would be a low ABV sweet cocktail, refreshing and easy to drink. Other people would prefer something strong. That’s why when a usual customer comes, I remember what he likes to drink. But in the end, a good company will make a good cocktail. Tea is my go to. We do different tea cordial. For instance, a nice drink is gin, tea cordial and soda water and it’s easy to drink. Like gin, there are so many different teas around the world you can play with. You have to go to Tokyo to meet Nagumo who works a lot with tea at Mixologist Experience and of course High Five where they focus so much on details. In London meet Matt Whiley at Scout who does a lot of fermentation and Ryan at Dandelyan, such a great concept. In Taipei go to Draftland, all the cocktails are on tap. To finish Hong Kong obviously, you have Zuma, Stockton, Potatoe Head, Otto e Mezzo which is a Michelin Star restaurant with a great bar, The Old Man and COA.